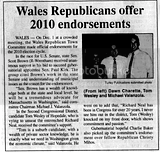 I am very pleased to receive the endorsement of the Wales Republican Town Committee for the Second Congressional District seat. The committee is a vibrant and enthusiastic group of individuals who are frustrated by the status quo from Richard Neal and the Washington Democrat machine led by Nancy Pelosi. They are anxious to have someone sympathetic to the needs of the district carry their message back to Washington. This is our district and we are going to take it back! I thank Chairman Michael Valenzola for his firm and decisive leadership of the Wales RTC. This endorsement represents the growing momentum that our movement has sparked and I am thankful for their confidence in our message. If you would like to join Team Wesley, please visit www.tomwesley.com, volunteer and donate!